Earlier this month, Dr. Clifton Potter ’62 wrote a letter to mark an important anniversary. 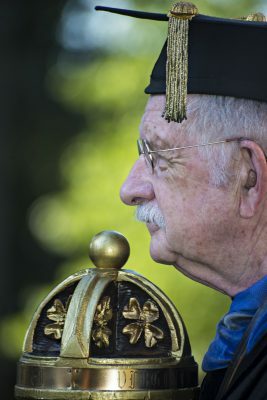 Dr. Potter’s 54th year of teaching history at his alma mater will be his last. Why is he retiring now? He listed several reasons to retire now as opposed to later: He wants to travel without the restrictions of an academic calendar. He has many books he wants to write, including a murder mystery, a sequel to his science fiction novel, and a history book about soldiers who died at a Civil War prisoner of war camp in Lynchburg. His hearing has faded enough that leading a class discussion is not as easy as it used to be, he said. But why he is retiring now, instead of years ago? Dr. Potter grew up in Lynchburg and worked at Jones Memorial Library as a teenager. One day at work, he ran across an article about the history of Lynchburg College, which was only about 50 years old then. Fascinated by that article, he read A Journey Through the Years, the autobiography of the school’s founders, Josephus and Sarah Hopwood. During his time as a student, he enjoyed a collegial atmosphere where he made many friends. He wrote for the Critograph, the student newspaper which he still writes a column for today. He met his wife, Dr. Dorothy Bundy Turner Potter ’64, in French class. She also taught history at Lynchburg for many years and retired in 2017. His four years in college were transformative for him. “By the time I graduated in ’62, what I really wanted to do was come back and teach,” he said. He attended graduate school at the University of Virginia and joined the Lynchburg faculty in 1965. 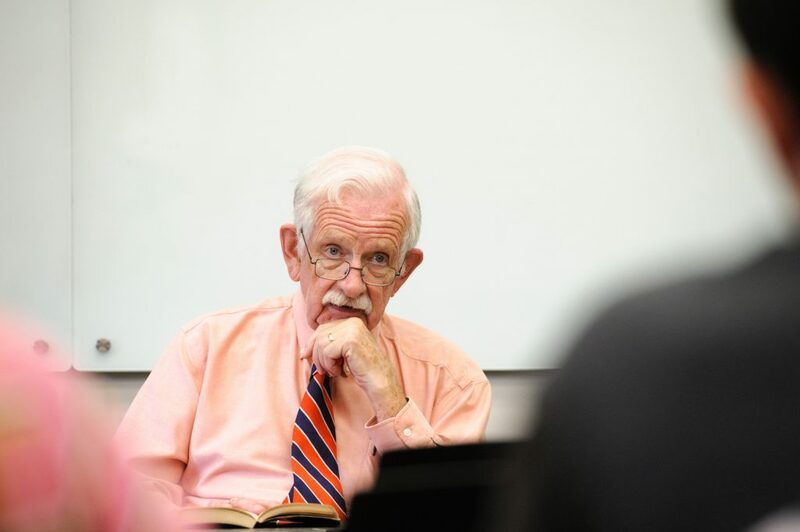 He has taught multiple generations of Lynchburg students and watched the institution grow into the university it is today. Dr. Potter said his teaching style has always focused on telling stories that illuminate history. For example, in a recent class about the history of crime and punishment, he talked about his ancestor who was a sheriff in Amherst County, Virginia, but also ran a covert station on the Underground Railroad. But his teaching also incorporates experiential learning. He was instrumental in forming a partnership with Historic Sandusky, a nearby home that was used as Union headquarters in the Civil War Battle of Lynchburg. That partnership led to the University owning the property, giving students valuable experience in archaeology and historical interpretation. “I’m a great believer in hands-on history,” he said.